- Start with a wide clear vase. - Nestle a smaller cylinder vase inside and insert a candle. - Layer dried corn, burgundy cockscomb celosia, pale green dried hops, and brown oak leaves between the two vases. - To expand the display, fill 6-inch cylinders with similar layers and insert small pillar candles into them. 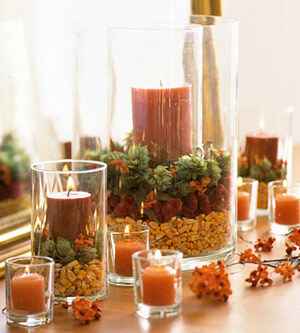 - Position small glass votive holders around the larger cylinders and add harvest-color votive candles. Wow, very nice madam...love it! Maayo kaayo ka mangita ug interim tsang da.